Most of you are aware that physical activity and body metabolism burns calories. Daily physical activity burns about 20 to 30% of the total calories (depending upon the quantity and type of physical activity). Body metabolism burns about 60 to 70% of the total calories. 10% of the calories are burnt after we eat food. This information might come as a surprise to many people - the process of digestion, absorption, transportation & storage of nutrients requires energy and some calories are burnt during these processes. This is one of the reasons, why your dietitians insist on eating regularly and not skipping meals. 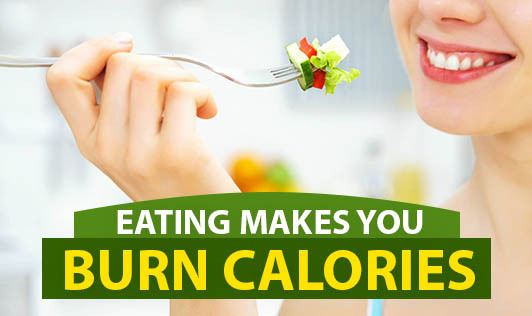 The amount of energy used during digestion of the calorie-giving nutrients also varies according to the type of food. The amount of energy needed to digest protein is more than the energy required to digest carbs or fat. But this doesn't mean that we need to eat only protein, or more protein than the other 2 nutrients. The key is to strike a balance between calorie intake and calorie output, and at the same time meet the requirements of all essential nutrients for the body. Confused? Don't worry, just ask your dietitian and she will guide you.